Tethering! What the heck is it? Flora sorts you out on BBC Click. Flora was on Saturday Edition on BBC Radio 5 Live talking about technology, from phones that do everything to expanding the number of IP addresses. Calling Thorney 202! Cruelly wind-swept hair didn’t stop Flora from discussing the Android security hole on CNN. 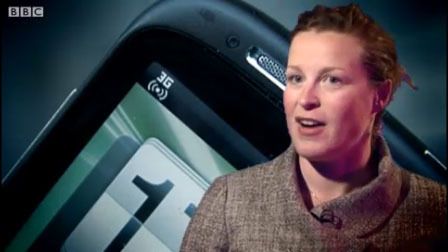 Flora pundited on BBC Click at Mobile World Congress 2011 in Barcelona. Flora often shows up as a guest on the CNET UK podcast, but she hosted the first show of 2010 thanks to the rest of the crew being lost in Las Vegas at the Consumer Electronics Show. In 2010, Flora will be co-hosting the show with Ian Morris.